Filed to: Drew who?Filed to: Drew who? Sonia Sotomayor's revelation that she enjoyed Nancy Drew mysteries as a child has everyone speculating on how the books might have influenced her. We asked Chelsea Cain, author of Nancy Drew parody Confessions of a Teen Sleuth for her take. — Can you describe the politics of the Nancy Drew books? What is their attitude, if any, toward race, class, gender? Do the characters ever explicitly discuss political issues? 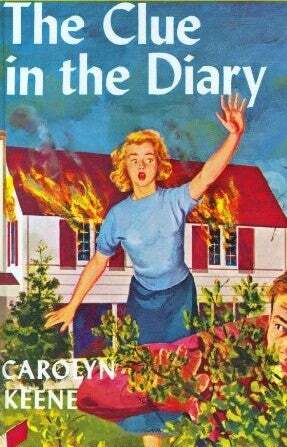 There's no overt politics in Nancy Drew books. They're conservative, in the sense that the status-quo must be maintained. Order must be restored. Nancy's father – world-renown attorney Carson Drew, certainly would have voted for Hoover. But Nancy herself has a liberal bent – she is always lending a hand to orphans and the elderly – a true Roosevelt democrat. Race is tricky in the books. The language is dated. "Orientals" abound. And there are a disproportionate number of "ethnic" heavies in the original stories. (For a town in the middle of nowhere, River Heights, was remarkably diverse – it had a Chinatown.) But there are also ethnic characters who are the victims of crime, and who are rescued by Nancy and treated respectfully. The books are much clearer on class. Nancy and her father are upper middle class. They live in a colonial. They have a housekeeper. Other characters are often defined by their class trappings. They are either wealthy people who have fallen on hard times, or very poor people, or hard working people. The early books especially pay a great deal of attention to issues of money, probably because they were written during the depression, so it was hard to ignore. Many of Nancy's mysteries involve Bad People trying to steal property from Good People. Gender. Well, Nancy's friend George was totally a lesbian. She had short hair (!) and "loved her boy's name." Nancy's other friend Bess was "pretty and plump," and afraid of her own shadow. So these two gender extremes bookended Nancy, who fell somewhere in between. She was "slim and attractive," and always well put together. She liked girly things like ballet. But she was also brave and confident and could drive a boat and change a tire. — What are Nancy Drew's values as a character? She's independent and curious and a problem-solver. She's also vain (she and George mock Bess mercilessly for being plump) and is always committing petty crimes like breaking and entering and driving over the speed limit. — Is Nancy Drew a feminist? Are the Nancy Drew books feminist books? I'm going to argue yes. I think the reason that Nancy has appealed to so many generations of girls is that she is such a strong female archetype. She solves problems by herself. She's capable and confident. Sure, she's always getting chloroformed and stuffed in a trunk, but she's gets herself out of it. She's independent. She's smart. Even Chief McGinnis asks her for help solving crimes. And she can crack a code and perform first aid. There are troubling (less feminist) attributes to her character, too. We are reminded endlessly of her popularity and good looks. But I think she makes up for it. And she rescues the men in her life (her father, and "special friend" Ned Nickerson) way more than they rescue her. — What does it say about Supreme Court nominee Sonia Sotomayor that she loved Nancy Drew as a child, and that she chose to make this fact public? How might the lessons of Nancy Drew apply to issues before the Supreme Court, like abortion, affirmative action, etc.? How might these lessons apply to the work of being a Justice in general? I think it speaks well of Sonia Sotomayor that she read as a kid. She loved books. I don't know that it even matters which books. And I think that more than anything that is the greatest legacy of the Nancy Drew books. They were gateway reading. Girls picked them up, fell in love with the mysteries and adventure. And then put them down and picked up something better. Much has been made of Sotomayor's reading choices, but maybe we should be glad that she read at all — and that she can remember what she read. Givhan and O'Rourke see Sotomayor's Nancy Drew period as a predictor of her adult character, but Cain's analysis is more modest — for her, Nancy Drew was just a stepping stone on the way to what has obviously become a successful and varied intellectual life. Not earthshaking, perhaps, but not bad for a girl sleuth whose hobbies were breaking and entering, eating cinnamon toast, and trying on dresses at the local department store.